Our accomplished instructors invite you to become part of the TBK family. Sensei Robinson teaches teenage and adult karate classes. He is a 6th degree black belt in shotokan karate with more than 30 years of training. He was nicknamed Deshi (disciple), by his instructor Shihan John McClary of Philadelphia, for his passion and long hours of training. He’s become a favorite demonstration partner for world renown instructors including Nishimura and Mirza. Sensei Robinson has a degree in kinesiology from Long Island University, spent a decade in corporate America and 6 years in the personal training industry, and now teaches karate full-time. He played football and ran track in high school. In 1997, he and two other Americans won gold in Team Kata at the World Karate Confederation in Italy. In 1993, he won world championship titles in Individual Kata and Team Kumite at the Traditional Karate International Confederation in Panama. Sensei Yu is a 6th degree black belt in shotokan karate and a 1st degree black belt in shito-ryu. She has tested for shotokan ranks before JKA Sensei Kenichi Haramoto and Hidetaka Nishiyama, and before legendary Hirokazu Kanazawa, Kenzo Mabuni, and Osamu Ozawa. 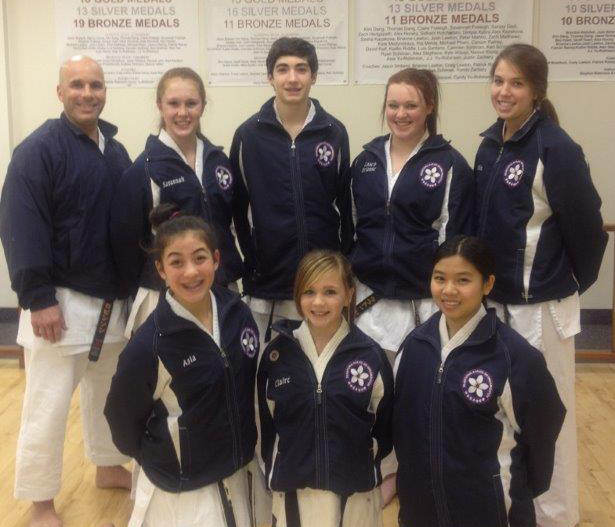 Sensei Yu currently teaches youth classes, cardio, and women’s self-defense seminars. She has degrees from Stanford University and UC San Diego, and was a swimmer and cheerleader in high school. Sensei Lawton is a charter member of Best Karate dojo; he started training from our opening day in 2004. Sensei Lawton completed two years of instructor training in Philadelphia, teaches beginner and advanced adults, and is part of the coaching staff for the dojo's competition team. He is a 4th degree black belt (YonDan) and lives with two other black belts, his daughter Brianne and his son Joshua, both of whom were members of the AAU Karate Junior National team. Sensei Craig also is an executive with an international banking institution. His high school sports were swimming and water polo. Sensei David Reif began his karate training in 1998 at the College of William and Mary, received 1st degree shotokan rank from a test panel led by Sensei Teruyuki Okazaki. As Dr. Reif moved to Vanderbilt University for graduate studies, he continued training and received 2nd degree black belt in Gojuryu from a test panel led by Sensei Morio Higaonna. Since 2006, Sensei Reif has been training in Raleigh at Triangle's Best Karate and has received 2nd, 3rd, and 4th degree black belt ranks in shotokan as a student of karate, as a competitor, and as every youth's favorite instructor. Dave trains because "it provides balance in his life" as a leading scientist, professor of genetics, and now husband and father. His high school sports were football and soccer. Sensei Patrick Rainey began training karate in 2005 and demonstrated incredible flexibility and athleticism in his first class. As a 4th degree black belt, he also serves as Head Coach for Best Karate Competition team. Dr. Rainey has a PhD in chemistry and has worked as a research scientist, a teacher at the NC School of Math and Science, and as a consultant for medical labs. Sensei Patrick's high school sport was football. Sensei Ken Schiman started UechiRyu in college and brought an undeniable fighting spirit to Triangle's Best Karate beginning in 2006. He loves the martial arts and coaching boys and girls of all ages and abilities in the day to day training as well as national level competitions. Coach Ken is a 2nd degree black belt who trains everyday for physical and mental health while developing and managing IT systems. Coach Ken played football and lacrosse in high school. Sempai Dimple is a second degree black belt who has trained at Best Karate since 2007. When in high school, she was introduced to Jiu-Jitsu and Shotokan Karate and fell in love with martial arts ever since. She manages IT projects for the State of North Carolina. Sensei Dave Henshall, Yondan Shito-Ryu, has studied various traditional weapons since 1995 with Sensei Dometrich and others. He teaches kobudo (weapons) and coaches our local and national team members. Sensei Henshall also teaches karate at Carolina Martial Arts in Durham under Shihan Kevin Gurganus. Sensei Henshall competes regularly in Open Hand Kata and with Sai, Kama, Bo, Eku, and Tonfa! J.J. has been a consistent member of the dojo since age 4 and a competitive karate-ka since age 5. He is currently a 2nd degree black belt and conducts the Brown Belt, sparring, and conditioning classes. J.J. also plays football for Broughton High School and pick-up basketball. Won 2-6 Gold or Silver Medals at AAU Karate National Championships, 2008-2018.